Since starting the textbook rental service at the Texas Wesleyan University last fall, Store Manager Randy Guttery says business has been good as students continue to take advantage of the new service. According to Guttery, the program was added as an option to help students decrease the cost of college. 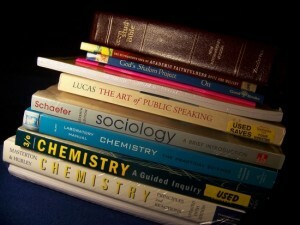 He also added that rented textbooks are 40% to 60% off their retail price. As is the case in many situations, college students fork over a small fortune for books only to be denied the option of selling them back due to the fact that the course has switched to a newer edition or the bookstore has a surplus of that particular item. Renting, on the other hand, bypasses all of those problems. Guttery noted that when a student rents his/her textbooks as opposed to buying them, they do not have to worry about keeping the book once they are finished with it. In addition to that, the bookstore has not acquired many problems with the rental service either. Guttery stated that a majority of the students are very good about returning their books once they have finished with them and keeping them in good condition. There are, however, setbacks to the rental program, especially when it comes to not returning books on time. According to rent-a-text.com, if a student does not return their books by the due dates then he/she will be charged a non-return fee, a processing fee and the difference in price from the rented price to the retail price. In addition to that, if a student does not return their books then they are prohibited from renting textbooks from the bookstore ever again, even if they have paid all of their fees. Peel believed that there are valid situations in which returning a book on time cannot be accomplished. “My wife had gallbladder surgery near the end of the school year and it became a bigger ordeal. By the time she was well, it was too late,” Peel noted. Other students, like Junior Psychology major Brittany Minor, like the new textbook rental service. “If I was able to rent it, then I know I can return it,” she said. “I hate when we have to buy our books and then we try to sell them back and they won’t take them.” Minor also added that so far the rental service has been a good experience and that she recommends it to other students. Speaking from my own experience, I know how expensive textbooks can be. I also know the sting you feel when you buy a $180 book only to be told four months later that returning it is impossible because the school has switched to a new edition. If you have the opportunity, I strongly recommend renting your textbooks in the coming semesters as opposed to buying them; the money saved could be staggering. This entry was posted in Technology Rental and tagged Texas textbook rentals, Texas Wesleyan University, textbook rentals, textbooks, Wesleyan University. Bookmark the permalink.